Home » Our Doctors » Clint Stengel, O.D. Born in West Texas, Dr. Clint Stengel was raised in a small town southwest of Houston. 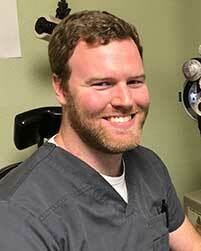 He completed his undergraduate studies at The University of Texas at Austin, before moving back to Houston to attend The University of Houston College of Optometry, where he received his Doctor of Optometry degree as well as his Optometric Glaucoma Specialty. He quickly moved back to Central Texas after graduation, where he and his wife currently enjoy camping, UT sports, and brewing his own craft beer.